The relationship between politicians and broadcasters has always been fraught with tension. Today, every word and act of those who wield power is instantly broadcast and dissected on 24-hour rolling news channels, blogs and Twitter. But in the past, broadcasters were banned by law from debating anything newsworthy and Parliament imprisoned those who dared to report what MPs had said. Since that censorship ended, the two sides have clashed repeatedly. Live From Downing Street takes us on an absorbing journey through the history of this power struggle, dwelling in fascinating detail on the charismatic key players from radio and television - the Dimblebys, Day, Frost, Walden, Paxman, Humphrys - and those who fought back - Churchill, Wilson, Thatcher and Blair. 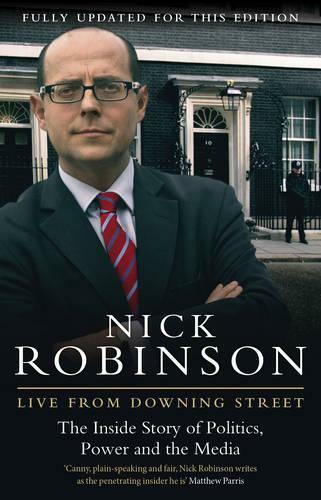 As the BBC's Political Editor, Nick Robinson is uniquely placed to add his own perceptive insights into the controversial issue of impartial reporting, providing a colourful and gripping account of the hard-fought battles for the right to tell the public about the decisions taken on their behalf.